After the expansion of Suvorovo–Novodanilovka chieftains through south-eastern Europe, and the use of kurgan burials by Cernavodă I and related groups (first half of 4th millennium), there is a process of coexistence and acculturation in the north-west and west Pontic areas at the end of the Eneolithic, ca. 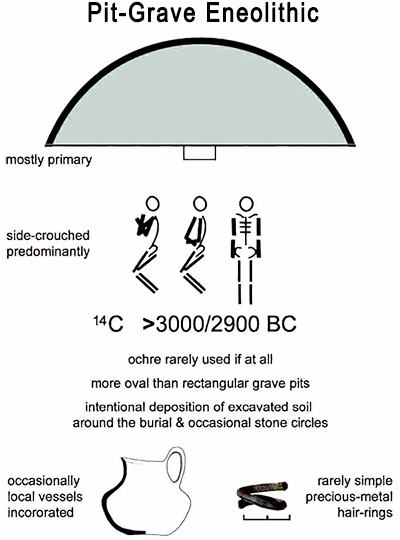 3600–2900 BC, where the first burial mounds indicate a lack of standardisation (Figure 17). This process is simultaneous with the evolution of Late Copper Age communities north of the Black Sea, such as Lower Mikhailovka, Trypillia C (including Usatovo), Late Kvityana, Late Deriïvka, Late Sredni Stog, post-Mariupol, and eastern cultures like Repin, Maikop, etc (Frînculeasa, Preda, and Heyd 2015). In these late Eneolithic ‘kurgan cultures’, primary graves consisted usually of small mounds (only later became enlarged), were orientated to various directions, and individuals lied in a contracted position to the side or (continuing earlier periods) in an extended position. Grave pits were more oval than rectangular, and ochre was sparsely used (if at all). Both males and females were buried, and only rarely had they assemblages. The most prominent burials with inventories are those of Trypillia C2, Horodiștea–Foltești and particularly Baden–Coţofeni (later evolving into Usatovo) at the Lower Danube. These are mostly local developments, although there might have been some infiltration of local steppe peoples from the Lower Mikhailovka and Kvityana into the Lower Danube (Frînculeasa, Preda, and Heyd 2015). Unlike Marija Gimbutas’ claim of succeeding ‘kurgan population waves’ into south-eastern Europe, the Eneolithic period shows merely a long-term, low-level population interaction between similar steppe environments north and west of the Black Sea, continuing some of the cultural patterns left by Suvorovo–Novodanilovka chiefs ca. 4600–4000 BC, representing therefore local populations integrating ‘eastern’ burial customs in their own rituals (Frînculeasa, Preda, and Heyd 2015). Which of these populations might have been direct cultural heirs of the Suvorovo migrants, and which showed mere remains of their earlier influence, is unclear. Figure 17. Burial schemes of pit graves found in the Lower Danube region during the Eneolithic. Modified from Frînculeasa, Preda, and Heyd (2015). Precisely in these steppe areas north-west and west of the Black Sea are few pit–grave kurgans found ca. 3700–3000 BC, of variable shape and rituals, from the Prut–Siret–Plain to the south-west Balkans, including Horodiștea II, Gordinești-Cernavodă II, Foltești, Horodiștea-Foltești, and to the south into the Dobruja and the Eastern Thracian Plain in Cernavodă III and Ezero A1. Such simple, ‘steppe-related graves’ are also to be found to the west in cultures like Boleráz and Baden in the Carpathian Basin (Frînculeasa, Preda, and Heyd 2015). There are thus similar cultural findings all over Europe since the mid–4th millennium, unifying regions that were previously separated in material culture, as well as in social, economic and ritual aspects: so the predecessor of the Baden complex, Cernavodă III–Boleráz, spread from the Lower Danube to the Bodensee in the northern Alps (beginning ca. 3700/3600 BC); and later, ca. 3350–2700 BC, the Globular Amphorae in north and north-east Carpathian Basin and central Europe, and the Baden culture from the Carpathian Basin to the Northern Alps. Included among these related cultures and ceramic groups are those of the whole Balkan Peninsula and Lower Danube, almost reaching north-west Anatolia; and also the Corded Ware culture (Single Grave and Battle Axe culture, and neighbouring East European groups in the first half up to the mid–3rd millennium BC), eventually connecting the Volga with the Rhein and Scandinavia (Frînculeasa, Preda, and Heyd 2015). All these cultures are connected through a unifying pottery, fine ceramic—often drinking and eating ware—with identic shape (round to tappered bottom) and emblematic cord decoration (with mixed forms like the Cucuteni C-Ware), apart from prestige objects (viz. triangular silex spearhead and the European dagger idea), and symbolic aim and key elements of burial rituals (like individual graves, gender roles, and social attributes). Regional and cultural differences lie in technique/technology, specific subsistence economy, settlement patterns, and social organisation. It seems that these cultures were therefore united in certain essential social, spiritual, and religious aspects (Frînculeasa, Preda, and Heyd 2015). Apart from this, it is also apparent that the expansion of Suvorovo chiefs must have set in motion the start of the “Secondary Products Revolution”, which becomes full-fledged in eastern Europe ca. 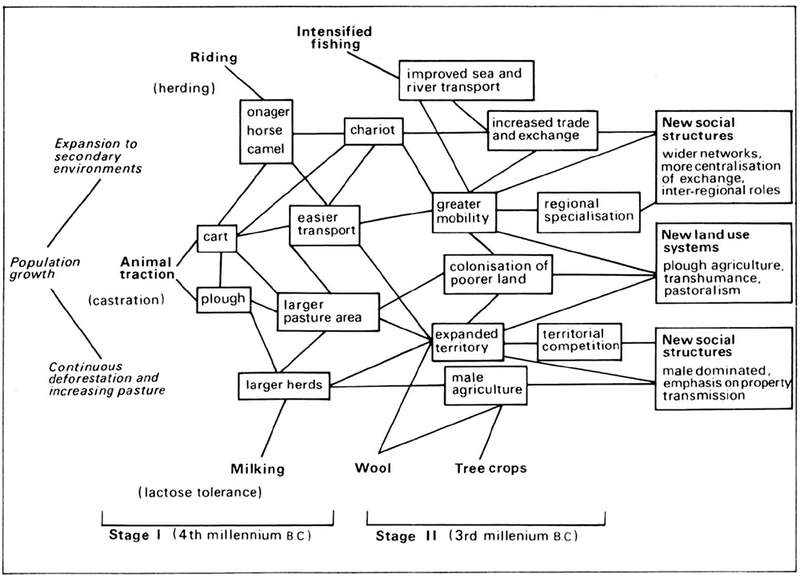 3600 BC, and includes traction, dairy farming, horse riding, and wool production (Figure 18). This revolution brought about changes in economic and social complexity, population growth, density pressure, expansion to secondary environments, deforestation and increasing pasture, and easier transport, greater mobility, regional specification or territorial competition. The new emphasis is thus on cattle, with a marked rise in its numbers, and a diminishing number of pigs (with a later, gradually rising number of goats and sheep), and it eventually affects all aspects of life, including social and spiritual beliefs (Sherratt 1981). Figure 18. Original graph of the ‘Interaction of the components of the secondary products complex through time’, by Andrew (Sherratt 1981). Corded ware refers to corded decoration of pottery assemblages, made with a cord, which has been proposed to be originally derived from twined hemp (the rope of which is used to control herds), hence related to cattle-herding cultures; or from wool cords, hence related to sheep and wool processing. Whichever the case, its spread over a great part of central Europe was mediated by the Globular Amphorae culture, which popularised the drinking vessels and their corded ornamentation (Bulatović 2014). In the first horizon of Corded Ware culture, a cord is twisted, or wrapped around a stick, and then pressed directly onto the fresh surface of a vessel leaving a characteristic decoration (Wickelschnur). This technique appears as a non-native trait in the Early Eneolithic Bubanj–Salcuţa–Krivodol cultural complex, with no correlation in autochthonous Neolithic traditions, possibly from influence of the Suvorovo–Novodanilovka and north-west Pontic cultures, at the end of the 5th millennium BC (ca. 4200 BC). This is supported by the presence of horse-head sceptres in the Balkans, which become sporadic in the south and central Balkans beyond the Danube—like cord decoration and other steppe-related material culture, such as funerary rituals or ceramic shapes —which may point to their adoption as a symbol of power and prestige, at the same time as steppe influence causes a cultural unity of the region, reflected in tell-type settlements, similar ceramic forms, anthropomorphic and bone figurines, zoomorphic altars, among others (Bulatović 2014). The spread of the 2nd Corded Ware horizon ca. 4000–3750 BC is clearly (and almost exclusively) identified with the Coţofeni group, especially Oltenia and Transylvania initially, and later Coţofeni-Kostolac towards the south, into the cultures of the Lower Danube and northern Bulgaria, together with pottery of the Cucuteni–Trypillian culture. These cultures are connected in turn with movements of the steppe-related Cernavodă I community in the Danube delta, to the south into Ezerovo (Bulatović 2014). The decoration is applied with a real cord, but ornaments are shorter and do not cover the whole girth, which is found only later in the classic central European corded ware. The corded ware decoration was adopted widely during in the middle to second half of the 3rd millennium BC in the north-west and west Pontic areas, the Balkans, and the north and north-east Carpathian Basin. Only in the central Balkans were new steppe elements noticed during this period, which may point to a closer cultural relationship of this area with the Pontic–Caspian steppe. The Usatovo culture, settled in the territory of the Trypillian culture, eventually replaced the Coţofeni culture at the time of the expansion of the third horizon of the Corded Ware culture into Central Europe. The third horizon of the Corded Ware culture appeared in the late Eneolithic / Early Bronze Age in areas to were Coţofeni and related cultures had expanded during the second horizon, including central (Vučedol, Bell Beaker) and northern (Classical Corded Ware culture), as well as central and southern Balkans, Greece and the Peloponnese, including the Eastern Thracian Plain, and also a western area in the Adriatic coast (through a southern route from Bell Beaker or Vučedol). These ornamentations are often local innovations connected to previous regional Eneolithic cultures (Bulatović 2014). There was a long-term connection between the north-west Pontic steppe area and the border of the forest zone up to the eastern Baltic area, centred on the Dniester–Buh limes (encompassing the Dniester, Dnieper, and Buh rivers). It also included the areas between the Vistula and the Dnieper (with the Lesser Poland area) – which topographically form a natural continuum.